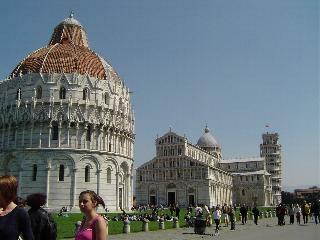 PISA, APRIL 2005, SEPTEMBER 2011 - The tower of Pisa is maybe one of the best known landmarks in Europe or even in the world, but there is more to it than just the tower - which is by the way still worthwhile and unique, not because of the way it stands, but because it is an architectural perfect round tower with I don't remember how many pillars... 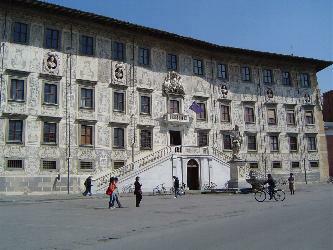 It is also the place where Galileo Galilei did his experiments about gravity. 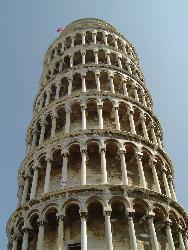 When you think about Italy, it's about churches, palaces, art...and a sense of religion and mysticism is never far away. All the clichés and souvenir stalls, and the crowds aside, this tower still is impressive and really stands in a dangerously inclining position. After the tower has been closed to the public for a long time, it is now open again, but only for a restricted number of people at the same time and for a "good price" - the ticket went up to 15 EUR per person, high enough to preserve the tower from too many tourists. 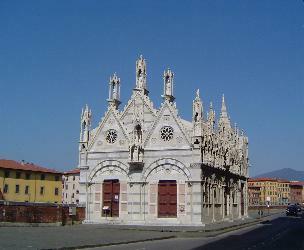 The most interesting to visit on the "miracoli square" however is the cathedral. Outside and inside are stunningly beautiful and the atmoshere is not fake - this is not just a museum. When I was visiting, a couple was getting married. The baptism chapel is the biggest of its kind in the world. The round chapel looks just splendid like the cathedral from the outside, on the inside it is rather simple and empty - but I guess that's just the point. When in Pisa, do not forget to take stroll along the Arno river, visit the surrounding churches, chapels and discover interesting little squares in the city center. Absolutely fabulous to me is the chapel of the holy needle - there is nothing much inside, but on a clear day the contrast of the sharp white details against the blue sky is fantastic. Another piazza we encountered had great buildings with sgraffiti, a technique to make great detailed paintings on the outside of the building.